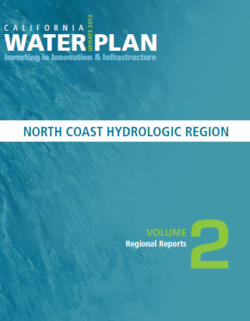 The North Coast Hydrologic Region is a unique setting with an extreme diversity of land use and climate. Land use includes aquaculture and larger urban areas near the coast to large cattle operations and low populations in the high mountain deserts. Ranching, farming, rural residential, timber harvest, vineyards, marijuana cultivation, U.S. Forest Service, and park land uses are prevalent. Variation in climate is immense with high precipitation along the coastal mountains to desert conditions in the Modoc Plateau. This chapter begins with an overview of the region, describing the setting and conditions within the region. Topics include information on the watersheds and sub-watersheds in the region with emphasis on developed resources. The chapter continues with a review of activities concerning resource administration and laws affecting resource management. This chapter concludes with a discussion of suggested resource management strategies to help assist local water managers in planning for future water needs. The Hoopa Valley Tribe has lived in its valley for over 10,000 years and has always depended on the migration and spawning runs of steelhead trout, and chinook and coho salmon in the Trinity River for a large portion of its diet. The Trinity River is also where the Hoopa hold their ceremonial Boat Dance and immerse themselves after using sweat houses built next to the river. 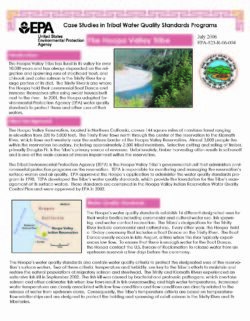 In 2001, the Hoopa adopted Environmental Protection Agency (EPA) water quality standards to protect these and other uses of their waters. Groundwater pumping, even if only seasonal, may significantly impact groundwater‐dependent ecosystems through increased streamflow depletion, particularly in semiarid and arid regions. The effects are exacerbated, under some conditions, by climate change. 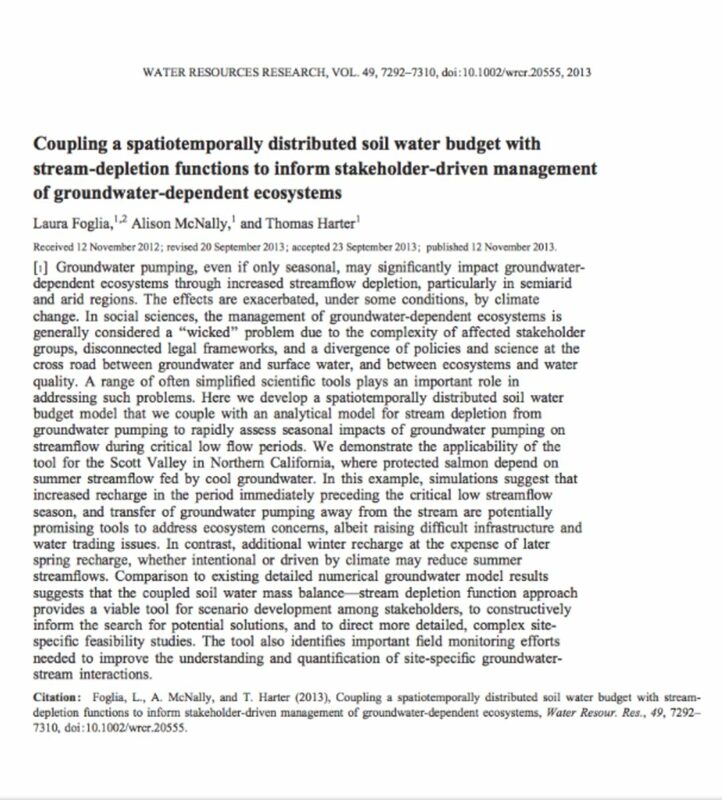 In social sciences, the management of groundwater‐dependent ecosystems is generally considered a “wicked” problem due to the complexity of affected stakeholder groups, disconnected legal frameworks, and a divergence of policies and science at the cross road between groundwater and surface water, and between ecosystems and water quality. A range of often simplified scientific tools plays an important role in addressing such problems. Here we develop a spatiotemporally distributed soil water budget model that we couple with an analytical model for stream depletion from groundwater pumping to rapidly assess seasonal impacts of groundwater pumping on streamflow during critical low flow periods. We demonstrate the applicability of the tool for the Scott Valley in Northern California, where protected salmon depend on summer streamflow fed by cool groundwater. In this example, simulations suggest that increased recharge in the period immediately preceding the critical low streamflow season, and transfer of groundwater pumping away from the stream are potentially promising tools to address ecosystem concerns, albeit raising difficult infrastructure and water trading issues. In contrast, additional winter recharge at the expense of later spring recharge, whether intentional or driven by climate may reduce summer streamflows. 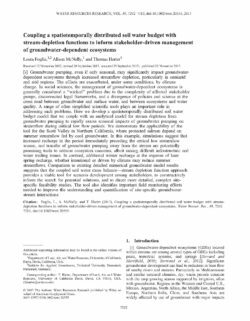 Comparison to existing detailed numerical groundwater model results suggests that the coupled soil water mass balance—stream depletion function approach provides a viable tool for scenario development among stakeholders, to constructively inform the search for potential solutions, and to direct more detailed, complex site‐specific feasibility studies. The tool also identifies important field monitoring efforts needed to improve the understanding and quantification of site‐specific groundwater‐stream interactions. Since 2001, irrigators in the upper Klamath Basin have increasingly turned to groundwater to compensate for reductions in surface-water allocation caused by shifts from irrigation use to instream flows for Endangered Species Act listed fishes. The largest increase in groundwater pumping has been in and around the Bureau of Reclamation’s Klamath Irrigation Project, which includes the Tule Lake subbasin in the southern part of the upper Klamath Basin. Agricultural drains on the Klamath Project are an important source of water for downstream irrigators and for the Tule Lake and Lower Klamath Lake National Wildlife Refuges. U.S. Geological Survey regional groundwater-flow model simulations and records of irrigation-return flow pumped from the Tule Lake subbasin into the adjacent Lower Klamath Lake subbasin have indicated that water-level declines from pumping may be causing decreased flow of shallow groundwater to agricultural drains. 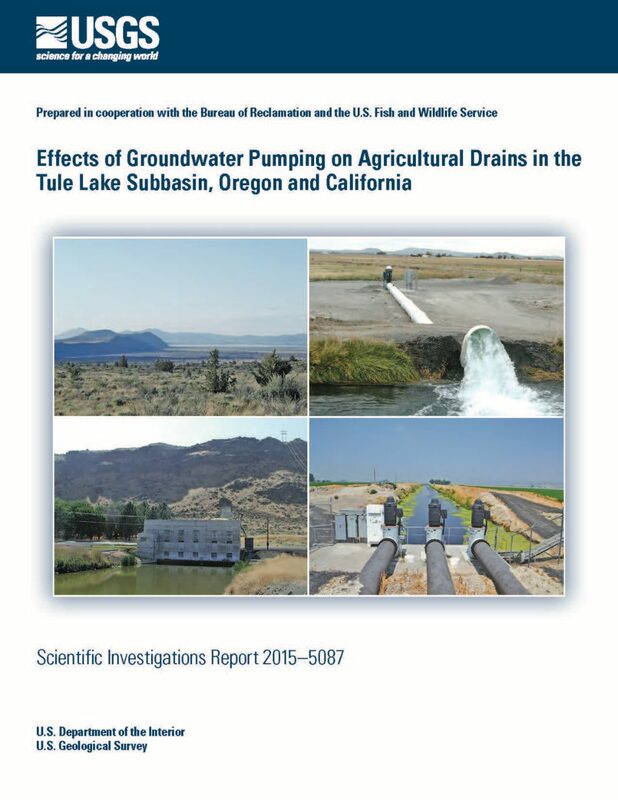 To better define the effect of increased pumping on drain flow and on the water balance of the groundwater system, the annual water volume pumped from drains in three subareas of the Tule Lake subbasin was estimated and a fine-grid, local groundwater model of the Tule Lake subbasin was constructed. Results of the agricultural-drain flow analysis indicate that groundwater discharge to drains has decreased such that flows in 2012 were approximately 32,400 acre-ft less than the 1997–2000 average flow. This decrease was concentrated in the northern and southeastern parts of the subbasin, which corresponds with the areas of greatest groundwater pumping. Model simulation results of the Tule Lake subbasin groundwater model indicate that increased supplemental pumping is the dominant stress to the groundwater system in the subbasin. Simulated supplemental pumping and decreased recharge from irrigation between 2000 and 2010 totaled 323,573 acre-ft, 234,800 acre-ft (73 percent) of which was from supplemental pumping. The response of the groundwater system to this change in stress included about 180,500 acre-ft (56 percent) of decreased groundwater discharge to drains and a 126,000 acre-ft (39 percent) reduction in aquifer storage. The remaining 5 percent came from reduced groundwater flow to other model boundaries, including the Lost River, the Tule Lake sumps, and interbasin flow. 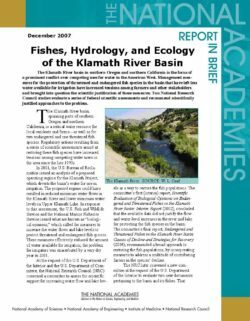 Instead of focusing primarily on how water levels and flows affect endangered and threatened fish in Oregon's Upper Klamath Lake and the Klamath River -- which run from the lake in Oregon through northern California before emptying into the Pacific -- the federal agencies charged with protecting the fish should focus on other kinds of initiatives, such as removal of migration obstacles, prevention of entrainment by water management structures, improvement and creation of habitat, and reduction of summer water temperatures in tributaries. The committee found some proposed actions as given in the 2001 biological opinions to lack substantial scientific support. In their biological opinions of 2002, the listing agencies appear to have resolved this issue either by obtaining concessions from USBR through mechanisms that are generally consistent with USBR?s goal of delivering irrigation water. 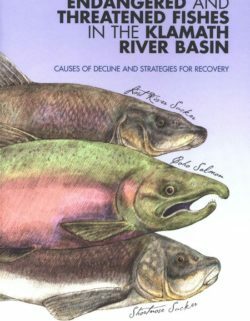 Adaptive management is accepted in principle by the listing agencies but has not been implemented in the Klamath basin for the benefit of the listed species, except as part of the Trinity River Restoration Project. Although suckers of all age classes are present in Upper Klamath Lake, population densities of suckers are low, and there are no signs that the populations are returning to their previously high abundance. An alternate hypothesis is that an unusual combination of temperature, flow, and migration conditions occurred in 2002, possibly in association with weather that prevented the river from showing nocturnal cooling to an extent that would usually be expected. Barriers to passage caused by dams and diversion structures are important to coho salmon. The main-stem dams on the Klamath River block spawning movements, as do Dwinnell Dam on the upper Shasta River and the Trinity River Diversion project on the Trinity River. Dams also have contributed to habitat degradation. CDFG has proposed that the shape of the channel in the lowermost reaches of the Klamath main stem changed in 1997?1998 under the influence of high flows, which caused fish entering the river to be unable to proceed upstream under low-flow conditions. Causes of extreme temperatures include diversion of cold flows for use in agriculture, flow depletion that leads to warming of cool water, and destruction of riparian vegetation that leads to loss of shading. Coho habitat has been seriously degraded in the tributaries. Lack of cover and impairment of substrate through deposition of sediments are common. Woody debris, which is critical as cover for young fish, has largely been lost as a result of human activity. Excessive depletion of flow may separate fish from adequate habitat in the last half of summer. Coho salmon, unlike Chinook salmon, remain in freshwater for an entire year, during which they mainly occupy tributaries, where summer water temperatures can be dangerously high. Decrease in main-stem temperatures by augmentation of main-stem flows is problematic because augmentation water must be derived from the surface layer of Iron Gate Reservoir, which is very warm in summer. During the second half of September 2002, numerous fish died in the lowermost 40 mi of the Klamath River main stem, 150 mi below Iron Gate Dam. Most of the dead fish were adult Chinook salmon that had just entered the lower Klamath River. If a lasting change in channel configuration was responsible, recurrence of the episode can be expected with similar low flows in the future. If other factors were responsible, recurrence may be much less likely. It is unclear what the effect of specific amounts of additional flow drawn from controllable upstream sources (waters from reservoirs on the Trinity River or Iron Gate Reservoir) would have been. Information collected through monitoring and research has been valuable, but the absence of an integrated, evolving management plan connected to monitoring, research, review, and periodic readjustment of management actions will hamper progress in the future. Mass mortality of large fish in Upper Klamath Lake has occurred for many decades, but anthropogenic factors, especially those leading to strong dominance of Aphanizomenon, probably have increased its severity and frequency. Poor water quality may also challenge the sucker populations in other ways. High pH, for example, could be harmful to young fish even if they are not subject to the mass mortality of larger fish. No obvious explanation of the fish kill based on unique flow or temperature conditions is possible. Nonnative fishes, which are diverse and abundant in Upper Klamath Lake, may be suppressing the populations of endangered suckers there, but no practical mechanisms for reducing their abundance are known. Reservoirs of the main stem Klamath have created new habitat capable of holding endangered suckers, but recruitment of young fish has not been observed. Reservoirs have low potential to support self-sustaining populations. The fish kill, although important for Chinook salmon, did not involve many coho salmon (about 1% of the total dead fish) because coho enter the river later than Chinook, and thus were mostly absent when conditions leading to mass mortality occurred. The immediate cause of death was massive infection by two types of pathogens that are widely distributed and generally become harmful to fish under stress, particularly if crowding occurs. The most important cause of impairment of coho salmon probably is excessively high summer temperatures in tributary waters. There is no evidence of a causal connection between water level and water quality or fish mortality over the broad operating range in the 1990s, the period for which the most complete data are available for Upper Klamath Lake. Neither mass mortality of fish nor extremes of poor water quality shows any detectable relationship to water level. The Klamath River basin in southern Oregon and northern California is the focus of a prominent conflict over competing uses for water in the American West. Management measures for the protection of threatened and endangered fish species in the basin that have left less water available for irrigation have increased tensions among farmers and other stakeholders and brought into question the scientific justification of these measures. Two National Research Council studies evaluate a series of federal scientific assessments and recommend scientifically justified approaches to the problem. The Southwest region encompasses diverse ecosystems, cultures, and economies, reflecting a broad range of climateconditions, including the hottest and driest climate in the United States. Arizona, California, Colorado, New Mexico, Nevada, and Utah occupy one-fifth of U.S. land area, extending across globally unique ecosystems from the Sonoran Desert to the Sierra Nevada to the Pacific Coast. The region is home to 60 million people, with 9 out of 10 living in urban areas and the total population growing 30% faster than the national average. The Nation depends on the region for more than half of its specialty crops such as fruits, nuts, and vegetables. 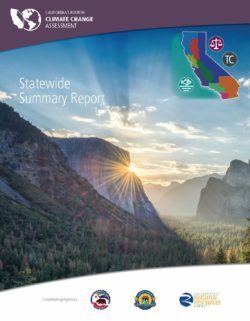 The Southwest also drives the U.S. technology sector, with more than 80% of the country’s technology capitalization located in California. 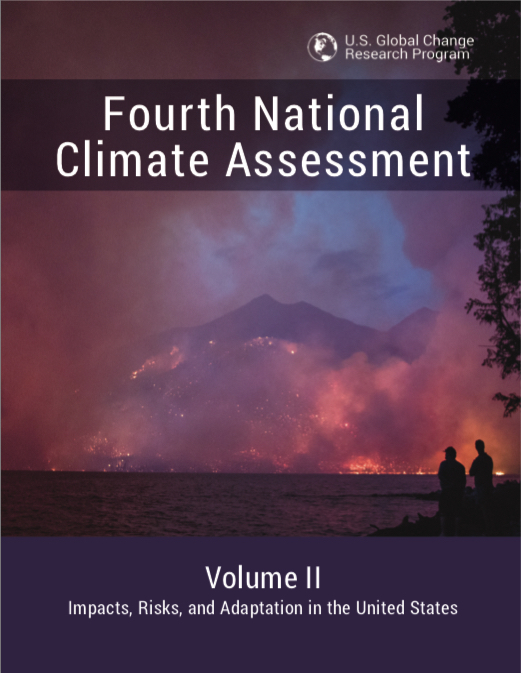 Click here for all chapters of the Fourth National Climate Assessment.